Continuing our series of placement year stories, this week Jessica Berko, a Marketing student at the Faculty of Management & Law, shares her experiences working as a Business Administrator at E4 Print & Design in Bradford. 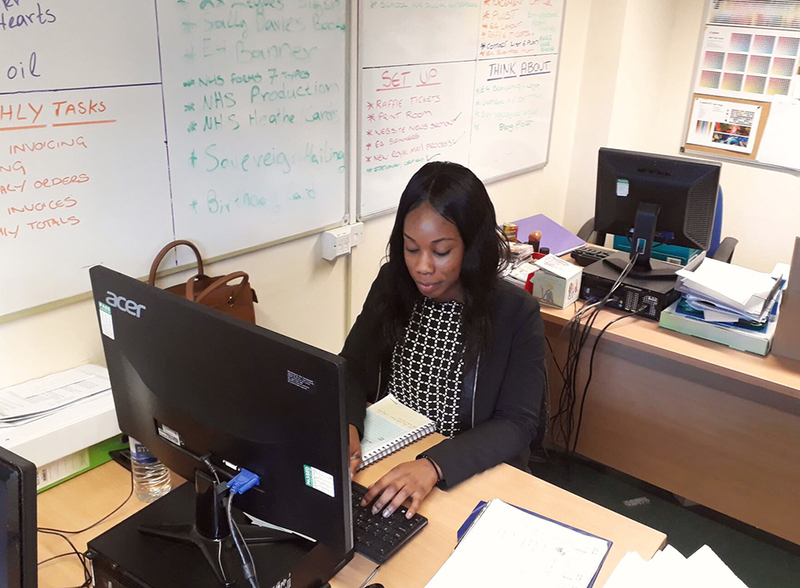 I was able to achieve a placement year thanks to the Careers service, who have been helpful from the beginning of my second academic year when I started preparing my CV for placements. What I found most useful were the CV checks and tailored mock interviews to the positions I applied for. During these sessions I was guided on how to write a professional CV and bring my skills forward as I had no marketing experience. I was also advised to speak to the volunteering team to help me gain some relevant experience. Finally, when my CV caught the attention of employers I made use of the mock interviews that the Careers service offer, and even with short notice I always had a chance to rehearse before attending the real interview. In my role as a business administrator, it’s my daily responsibility to organise, manage and check the progress of each job, instruct staff members, negotiate on priority and production method, and this has definitely helped me with my problem solving skills (although I still have room for improvement). When put in a real scenario with customers, profit and loss, I have realised this is an essential skill that cannot be learned during assessment or group project – it’s developed and mastered only by experiencing it in day-to-day challenges. In my placement so far, my employer and all of my colleagues have always been helpful and patient, and despite my initial inexperience my employer has trusted me to be in charge during his annual leave, and I was very pleased to be given this responsibility. A lot can be learned by experiencing the real word of industry, and as far as I’m concerned, there’s no disadvantage of taking a placement year. The knowledge and skills you will learn will be all worth it, plus you will make new friends and connections that may be really useful when you graduate. On top of this, you get paid as full time employee, you get to travel to a new city or country (and you are exam-free!). I hope that by reading this, if you haven’t thought about getting a placement year by now, you will consider it – I’m sure you will enjoy the experience. My advice would be to be very patient and transform any rejection into a lesson and a new opportunity. I was informed about my placement only in August and started in September after a whole year sending applications, so be determined, don’t give up on yourself and remember that the Careers service is always there to help at each stage. Thanks very much Jessica. If you are interested in a placement year, get in touch with us to find out how we can help, and check out our internship and placement webpages for more information.